First, the absence of any meaningful discussion during the general election campaign of the role of business in society was highly significant. Like Arthur Conan Doyle’s dog that didn’t bark in the night, the silence speaks volumes: the new consensus across all parties is that big business behaves badly and needs curbing – whether on the populist issues of executive pay, tax avoidance and utility price rises or on the more esoteric questions of corporate governance, modern slavery, gender and ethnic imbalances on boards and in remuneration; the list goes on. This new political consensus extends to having an interventionist industrial strategy and continuing with ambitious carbon reduction targets. Everyone agrees, too, about the need to do something for the people and places ‘left behind’ by global economic forces, even if the prescription differs widely – from Labour’s conventional tax and spend to the Conservatives’ return to a Heseltine era of local regeneration partnerships. (My pre-election review of the party manifestos is still available here). The second part of my analysis, however, was that most leaders of big business aren’t behaving as though they recognise the social and political context has changed dramatically. From the 1980s until the global financial crisis a decade ago, the prevailing consensus – indeed the basis of the modern CSR movement – was (crudely put) this: get the state off our backs, cut taxes and deregulate; that will unleash growth and prosperity which will trickle down; meanwhile you can trust us to behave responsibly, at home and abroad. The global economy was indeed transformed. Many did prosper, some handsomely (the owners of capital), some modestly (billions of the poorest in Asia). But some did not, or at least perceived they were being ‘left behind’ and their identities threatened – hence Trump, Brexit, LePen et al. A crude analysis, admittedly, but if broadly correct, it means big business won’t be trusted on the first set of issues unless they and their owners embrace the logic of second. And that means addressing the question of ‘fair shares’ – who gets the money up and down the value chain? That’s within firms between senior executives and the rest, and outside for those in a variety of contractual relationships, some very precarious. 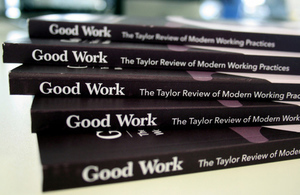 And so to the Taylor Review of Modern Employment Practices. This was notable in three respects. It set an overall goal of “fair and decent work”, incontestable surely yet evidently in need of restating. It accepted the merits of having a flexible workforce and proposed relatively few legislative or regulatory changes – the main one being to firm up a third category of employment status, namely ‘dependent contractor’ between employees and the self-employed. And it repeatedly endorsed good business behaviour as the best way forward – that work matters for health and well-being, that workers of all types need a greater voice in decision-making, that companies should offer ladders between the different types of employment status, and even that the technology which is undermining conventional employment can help in policing good new standards. At 116 pages it’s a long and detailed report, at times difficult to digest. However if Theresa May survives long enough in post and can follow through on its prescription – and if business embraces the opportunity to change its ways – the review may yet become a key milestone in the transition to a new economy.